The John Lewis and associated retail development at Sprucefield has been rumbling on for almost ten years. Arguments both for and against the proposed 500,000 sq ft retail development have been persuasive. While the development could bring 1,500 jobs to Sprucefield, the reduction in footfall could also decimate Lisburn’s remaining city centre retail businesses. It is clear that Northern Ireland has been hit very hard by the economic recession, and one of the areas that have suffered most has been small business and city centre trade. It is a serious concern that Lisburn is above the national average for vacant retail space. 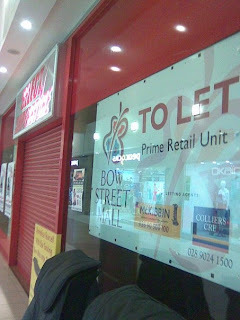 It is clear that Lisburn City centre needs help to survive. Investment, promotion and a truly local response is needed. To survive retailers will need to help each other on a local level to compete, revitalise their areas and address local issues. The Lagan Valley Green Party believe that the best way to address this problem lies with the Business Improvement District Scheme (BIDS) currently being considered by the Social Development Committee at Stormont. This legislation has been spoken about favourably by NIIRTA (Northern Ireland Independent Retail Trade Association) and has a proven track record in England, Wales and Scotland. The Business Improvement District Scheme allows any retailer to suggest a BID is set up in their area. This then is put to a vote, requiring a threshold of approval from other retailers in the area. If successful, a BID area is established. The scheme is financed by the retailers in this area in the amount of 1% of the rateable value per year. This is not a tax on traders who are already struggling. It is best thought of as redistributing some of the money from rates relief and routing it straight back into the scheme with one aim - to increase revenue. As it is local, it is the most sustainable way we have of getting local people back into the city centre - the lifeblood of our local economy. Town and city centres need better planning and more control for local business. We see this as the best way to deliver both. The Business Improvement District is democratic, a management committee is formed and each trader gets as involved as they want. Examples of BIDS in the UK have included creating a mobile cleaning unit, organising free transport to the town centre, creating festivals and running advertising campaigns. Each BID is reviewed regularly and ends after a set period. BIDS increase revenue and because they are run on behalf of the traders themselves, they are flexible enough to meet local needs. The Lagan Valley Green Party wants to see Lisburn City centre restored to its full prominence as a place to do business, meet, shop and relax. We believe the best way for Lisburn City centre to be revitalised is for small and large businesses to band together and invest directly in themselves as a group and a product. Lisburn needs and deserves a stable and sustainable local economy for its whole community.